This year I recommitted myself to working harder on my writing. It has been an uphill struggle every day. But I am determined not to give up. Determination is what most writers that go on to sell say got them there. I’ve seen it happen with my chapter members. I’ve listened to this same advice from multi-published authors. But in the last month I have seen it with my own eyes, in my son’s unshakable faith that he could master learning to ride a unicycle. Son is not an athlete. His idea of exercise is seeing how fast he can type. Which is pretty impressive at 150 WPM. I’ve tried to get him to walk with me, jog with friends, or take any kind of lessons to no avail. Imagine my surprise when he showed me a video of a guy on a unicycle, then said he wanted to do that. I was both thrilled that he was finally going to be active. But also hesitant to point out the pitfalls ahead. So I smiled and we started the hunt for one in our small town. In a strange coincidence his friend’s father still had his old one and gave it to him. We brought it home and he started practicing 2 to 3 hours a day. The first week was all about trying to stay on for one wheel turn. In a week he broke the 30-year-old cycle. I asked him if he was sure he wanted to continue. He just handed me his Christmas money and in two days he had a brand new one. Everyday he was outside as soon as he finished his studies. I watched, heart aching every time he fell off, cheering when he stayed on. Every milestone was recorded. The first time he made it around the carport, fingertips out for balance. First time down the driveway, arms flaying like a drunken helicopter pilot. In three weeks, he had gone from I want to do this to accomplishing his goal. Now we just throw it in the car and off to the park. 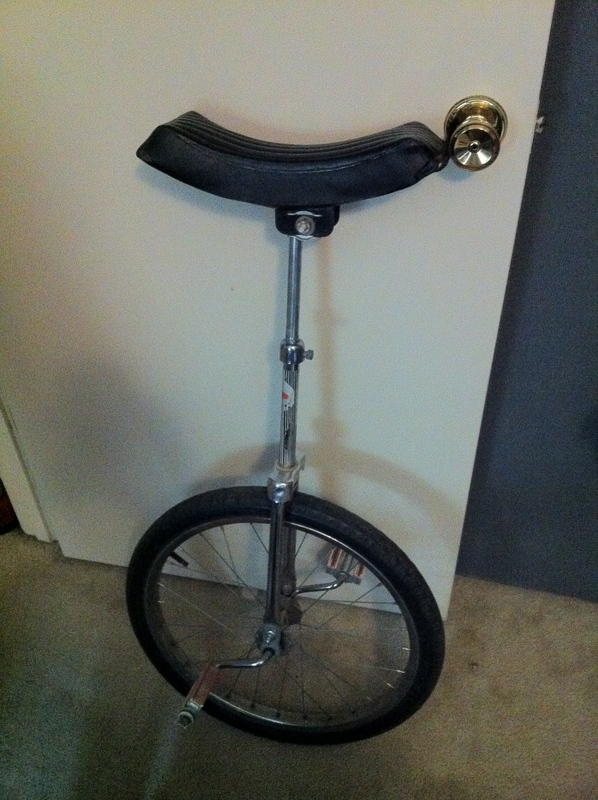 While I walk, he unicycles around all the small kids who think he is very cool. I couldn’t be prouder of him. I am still determined, even more so now. Just as I cheered my son on, he’ll do the same for me. He comes inside eyes shining in excitement, sweat on his brow, asking me, “Mom have you written today?” Sometimes all a writer needs is to learn to unicycle.